Home Nutrition Health Observations of a Chocolate Lover! Health Observations of a Chocolate Lover! There is a chocolate full of controversy always in every person’s life! The only thing you can’t resist doing with it is unwarp it and eat it! The guilt post the ingestion is normal, but the story happily repeats. Unwarp. Eat. Wallow in Guilt! But is there really a point in that guilt? I for one eat a lot of dark chocolate! Once my kids are in bed, I call it the start of my day and then I head to the freezer, pick a dark chocolate and go slump on the couch, get a book. I have the sweetest tooth ever. I can elaborate on it by saying that I can breakfast and lunch and snack on chocolates! I need the sweet fix and I might as well get it the right way! However, let’s get to the point quickly on how it has never let me gain weight or have any negative health repercussion! 1. Once I get my chocolate indulgence, I eat less sugar or sweet through the day. I treat myself with chocolate. And if I go beyond that treat then I just don’t enjoy my chocolate indulgence at all. So what happens is that once I get my chocolate fix the rest of the day I turn to fruit or any other healthy sweet option. Going as healthy as I can through the day so that I can enjoy my chocolate fix is a win-win situation! 2. I prefer chocolates over the so called sugary chocolate cookies. The logic stands quite simple. Is it a junk craving you are giving into or a chocolate craving? If it’s the latter then I would say eat that. Get your fix. Enjoy it to the fullest and you should say you are done and want no more! At least for the day! 3. I feel quite happy and energetic to have gotten my favorite sweet fix-which further gives me the motivation to go for my workouts! Whether I am on a run or in the gym – I kick myself harder towards an overwhelming sweaty experience! Thanks to my chocolate. But here is what makes it all go right. 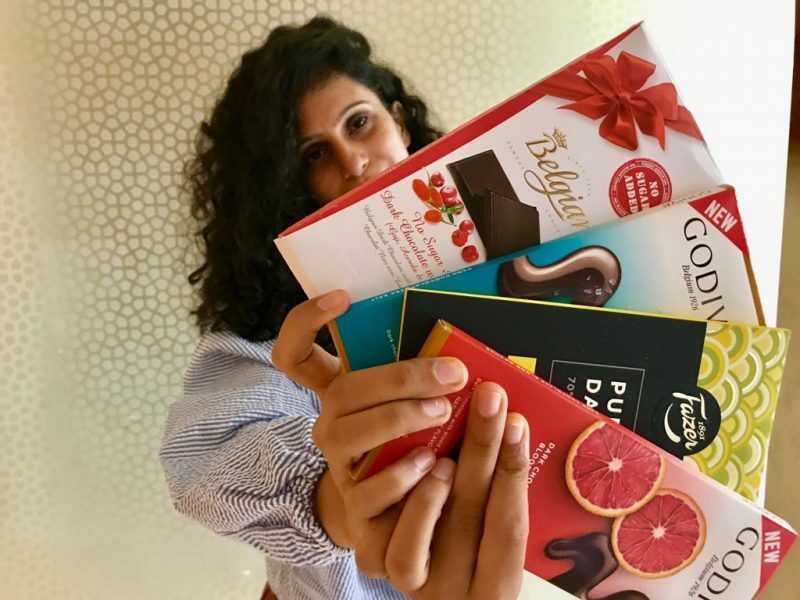 It all depends upon the kind of chocolate I eat – A good friend who is a nutritionist understood my love for chocolates and advised me to look for ones that have very few ingredients – good quality dark-chocolates and most definitely one that does not have sugar as its first or second ingredient. Get a chocolate which has cocoa solids as the first ingredient. It has no sugar or very less sugar and that’s what you need to get your antioxidants in! There are so many amazing studies that tell us how good chocolate is for the heart, full of minerals, reduces cholesterol, good for the skin, lowers blood pressure! There is no reason to kill that love for chocolates. There is every reason to get the best out of them by savoring the right chocolate- especially the good quality dark chocolate variety. Also, how about you get dark chocolate-covered cherries and almonds? It’s healthy and yummy all the way. Chocolates don’t make us fat! It’s the excessive mindless eating and lack of physical activity that make us fat. Need any more reason to eat more of chocolates? And now could you pass me some more of that bitter sweet dark brown bar? Love letter to Yoga – Because to Express is to Feel Alive! Yes it is. I found most of the Chinese and Singaporeans having chocolates – 20-30 minutes before the marathon. Vernon Morais- any other pre-run munches you reco?